Koh Tao is an exotic and tropical heaven where rarely people don't come back after the first visit, our goal is transform our customers in friends not only supplying good services at cheap prices but also sharing with them the love we feel for this island. 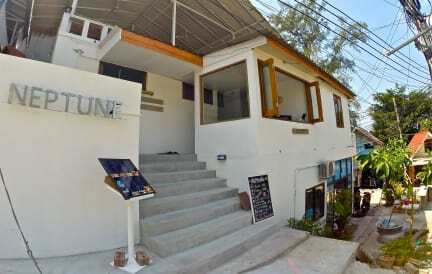 Neptune is a Boutique Guesthouse & Hostel located in Mae Haad, Koh Tao harbor. On the Guesthouse/Hostel's terrace, that overlooks the port of Koh Tao, is located our Mediterranean Restaurant/Cafè, the perfect place where our guests can relax after a diving, snorkeling or 'doing anything' day. We offer 5 rooms A/C, TV sat, Hot water + 30 beds A/C, towels, bed sheets, blankets, pillow, padlocks, bed lights Free WIFI and CCTV security cameras are provided in the building. We are 50mt walking from the beach. 1).Check in from 11am and check out before 10am. 2).1 day advance notice for free cancellation. Il Neptune è una delle migliori guest House di tutta l’ Isola. Location ottima, personale giovane, cortese e sempre disponibile, camere sempre pulite e cibo ottimo. La consiglio vivamente! Ho soggiornato solo per una notte in questo ostello grazie alle recensioni e non mi sono sbagliato! Ottima location, vicino al porto con ristoranti, bar e negozi a portata di mano. Lo staff si è presentato molto disponibile e gentile! La camera pulitissima! L'ostello offre anche servizio ristorante! Vi consiglio di provare la carbonara...ottima!!! Lo consiglio assolutamente, rapporto qualità prezzo ottimo! 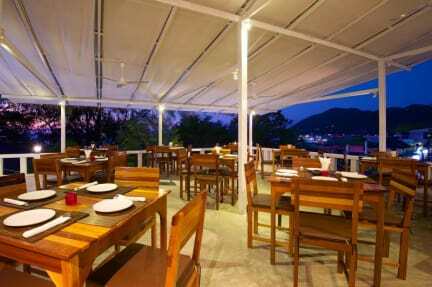 The location is amazing, there is a beautiful sight from the restaurant at the roof. The italian food is really good bearing in mind that we are in Thailand. The rooms are ok, nothing too expensive. It is actually what I was looking for.